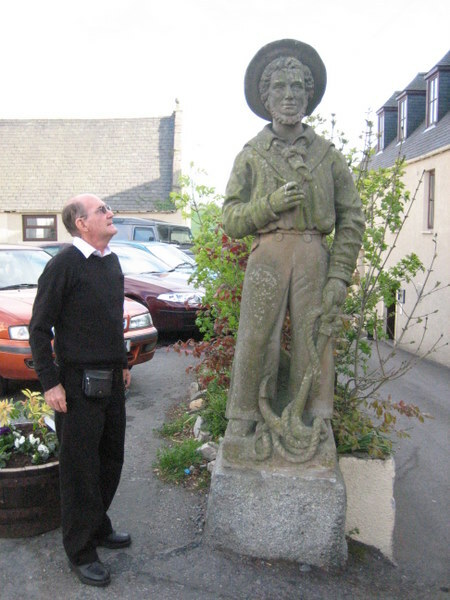 The Mannie (1822) that had belonged to Postie Lawson now located outside the Old Meldrum Hotel, with William Lawson casting an acquisitive look at the statue of the old sea dog. The new website for the Meldrum Arms says of the statue: "Before taking up residence at the Hotel, we understand that the Sailor previously resided in England, & at Alford & Craigievar. Commander Kelly(an ex-mariner), who was the owner of the Arms bought the statue from “Postie Lawson” at Craigievar in 1938. The complete history of the Sailor is not recorded, however he is made of Devon freestone & stands 2 metres tall. He is dressed as a French sailor, with a goatee beard & a fine head of curly hair. In his right hand he has a pipe and in his left hand an anchor. The story goes that he was married to an English woman, after he was drowned at sea, she had the statue made in his memory. “The Sailor Boy” is now a listed statue."